Luxury/loaded 2 bedroom/2 bath condos (sleeps 6) on Bowman's Beach, Sanibel Island in a 108 unit condo complex complete with swimming pool, tennis courts, canoes & kayaks for free checkout, fishing pier & the Gulf of Mexico! 1st & 2nd floor units available. Formal diningroom, fully equipped kitchen complete with dishwasher, microwave, full size stove & refrig, blender...down to the champagne glasses. All linens included (even beach towels! )4 bikes to use with unit, beach chairs, pool toys, sand pails, games, VCR & video library, stereo, iron & ironing board. Electric mounted hairdryers in baths. Crib, umbrella stroller & "pack & play" for taking to the beach or pool area included in the units. Washer & dryer in the unit off the kitchen. You may choose between a King or queen in the master bedroom,walk in closet. Some units with 2 queen size beds in 2nd bedroom,& queen sleeper sofa in the livingroom. Additional Cot & crib available in one of the units. Booster chair, crib, games & toys, over 100 videos, 4th best shelling beach in the world, beach chairs, tennis rackets, fishing poles. Captiva Cruises (see dolphins, visit "island only accessible via boat), Bailey-Matthews Shell Museum, Ding Darling Wildlife refuge (see alligators), air boat Everglades rides, Sanibel Factory Outlet shopping mall, 3 golf courses on the island, Sun Harvest orange factory, Shell Factory, SunSplash Water Park, over 100 shops & restaurants, Winter practice for Minnesota Twins, Boston Red Socks & summer baseball with the Miracles baseball team (Twins farm club). Within driving distance to Busch Gardens, Disneyworld, Orlando, Epcot Center, Universal Studios. 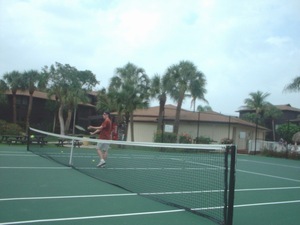 2 professionally maintained tennis courts are available for use 8 a.m. until dusk. Discounted winter rates for the month of January, 2003: Jan. 4-Jan. 18: $995 per week plus tax. Jan. 18-Feb. 1: $1100 per week plus tax. Deposit: $300.00 refundable security deposit to book. Cancellations and Refunds: 60 day advance payment required. Rental agreement provided. Some dates security deposit is not refunded unless re-rented. Other Fees: Standard $38 registration fee. Owner will pay cleaning fee and linen fee. Credit cards available for the payment of security deposit.